Celebrating the life of James E McCauley, Sr.
Obituary for James E McCauley, Sr.
James E. McCauley Sr., 75, of Franklin, was called home to be with the Lord and his beloved wife, Linda of 30 years, on January 20, 2019 as he was surrounded by his family and friends. Born August 30, 1943 in Oil City, Jim was the son of John McCauley and Hattie Yashinski, and step-son of Walter Yashinski. He attended Oil City Schools. He enjoyed spending time with his family and friends, and enjoyed drinking his Coca-Cola. He also enjoyed watching 'Pay-per-View' Wrestling with his son, Jim, and grandson, Tyler. He loved going on ghost-hunting adventures with his grandsons, Jimmy and DJ. He also enjoyed spending time with his son, Dewey, attending fishing seminars and sportsman banquets. Jim also loved going on shopping trips with his granddaughters, Meghan, Shiann, Ashley, Brittany, and Creena. He was a loving Pap to his grandchildren, and was always there for his family. He had a great sense of humor and was always making everyone laugh. Jim was married to the former Linda D. Winger on July 15, 1971. He was a doting husband and loved his wife very much. After high school, James went to work for Andrew Advertising. He left Andrew's to enlist in the Army. While serving in the Army, he was awarded the Marksman and Sharpshooter Badges. He was in the Army Reserves for 4 years. Following the Army, he went to work at Polk Center, and was there for 20 years before taking an early retirement to take care of his wife, Linda, whose health was failing. He also worked for McCauley Painting where he was in business with his son, James. James was preceded in death by his wife, Linda; his parents, John McCauley and Hattie Yashinski; his step-father, Walter Yashinski; his Uncle Dewey and Aunt Ella Mae McCauley; and his brother-in-law, Peter. Jim is survived by his sons, James E. McCauley, Jr., and his wife, Shanon, and Dewey J. McCauley and his wife, Veronica. 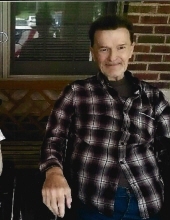 He is also survived by his grandchildren, James E. McCauley, III and his wife, Ashley, of Franklin, Creena Erwin and her husband, Jacob, of Parma, OH, Tyler McCauley of Franklin, Meghan McCauley of Franklin, Brittany McCauley of Dayton, OH, and Dewey McCauley, Jr., Shiann McCauley, and Ryan McCauley, all of Franklin. He is also survived by 2 great-grandchildren, Allijah James and Oaklynn Marie Erwin of Parma, OH. Family and friends will be received at the Gardinier Funeral Home, Inc., 1315 Chestnut Street, Franklin on Wednesday, January 23rd from 1 - 4 p.m. Funeral Services will follow visitation with Rev. Jonathan Bell, Pastor of the Franklin Wesleyan Methodist Church, officiating. Interment will be held at Sunset Hill Memorial Gardens in Cranberry, where James will be laid to rest beside his wife. The family suggests that memorial contributions be made to American Cancer Society, PO Box 22478, Oklahoma City, OK 73123. To send online condolences, cards, flowers, or for more information, family and friends are invited to visit www.gardinierfuneralhome.com. To send flowers or a remembrance gift to the family of James E McCauley, Sr., please visit our Tribute Store. "Email Address" would like to share the life celebration of James E McCauley, Sr.. Click on the "link" to go to share a favorite memory or leave a condolence message for the family.